I am a married woman and mom to four amazing kids and I also have one foot in the business world. I have a business that started out with one of my great passions in life: Helping other women overcome food related struggles. I fought my own battle with eating disorders and food addiction and started groups to help other ladies with this huge struggle more than a decade ago. To better help them, I started writing a course and through the years it developed into a 12 Week study which includes my testimony, tons of information I gathered while studying this field, and research (most of my personal research was done right there in the groups I facilitated). 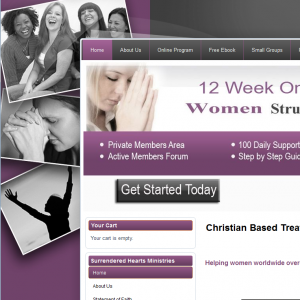 My husband encouraged me to upgrade the course and change it into an Online Program. I started making almost 100 Videos to go along with the course. What I had in my heart was to just talk to the ladies like I did in the groups, as if I was right there next to them, cheering them on and giving them tips on a daily basis. After many sleepless nights (I had to tape when all the kids were in bed) and of course a lot of crying as I relived the agony of this struggle (okay sometimes just out of sheer exhaustion), I finally finished it. I couldn’t have done any of this without God helping me every step of the way, family and friends praying for me and my husband encouraging me to not give up. Many wonderful women and moms world wide have signed up for the lifetime membership that I offer, and I pray that many more will receive freedom from this very lonely and very real struggle through this program. 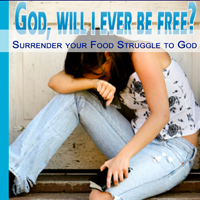 You can read the testimonies of the women on my website that have had learned how to surrender their food struggles to God, and walk in freedom through this online program. It takes a lot of work, but I must admit that I enjoy every minute of it. I love talking to other ladies, helping them and just seeing them change when they find truth in their situations. This course is based on the truth of the Bible, but it’s also very practical. I strongly dislike it when people preach to me without really telling me what to do. I wanted this program to be honest, down to earth and above all REAL. Therefore I jam-packed it with information, tips, guidelines, testimonies and research for real women, real moms, and real wives who struggle with food. I tell it as it is, because I’ve been there, and I know there’s a way out. I’ve also created small group material (workbook and DVD series), a condensed version of the online program called Appetite for Freedom. I am facilitating small groups where I teach Appetite for Freedom at my local church, City Bible Church in Portland Oregon. Now, this blog is part of my heart for the program. I want to write as much as possible of what I experience and deal with surrounding food and just life in general, again to help other ladies relate. When we see others overcome the same stuff we deal with on a daily basis, it gives us hope. Also, when we see their struggles, it makes us feel less alone and crazy and the enemy lose his grip on our hearts. I invite you to take part in all of this by leaving a comment and giving your testimony about food struggles, your relationship with God, your kids, or just life in general.